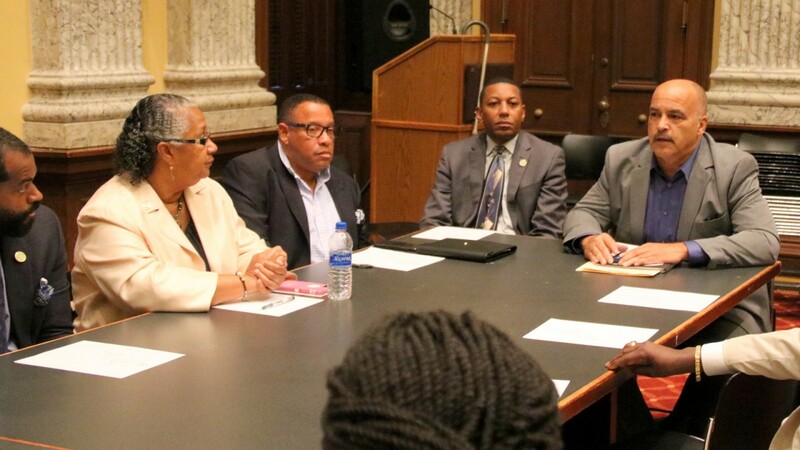 A vote to determine who will chair the Baltimore City delegation to the legislature – a vote that some lobbied hard to postpone – has gone forward anyway. It was a rare public display of the kind of ideological and generational conflicts among city Democrats that usually simmer quietly among close associates or get thrashed out on social media. As for the outcome, here’s the spoiler: after a motion to suspend the rules failed, Del. Cheryl D. Glenn, who represents the 45th District, was chosen as delegation chair. “Let’s go! I need to see that debate,” said Del. Maggie L. McIntosh, as the 6 p.m. gathering broke up and many headed off to watch the televised gubernatorial debate between Democrat Ben Jealous and incumbent Republican Governor Larry Hogan. Del. 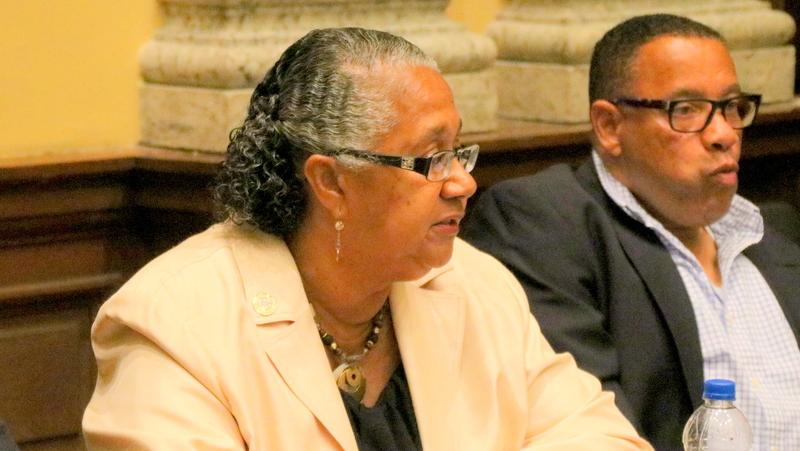 Mary Washington, of the 43rd District, was in a different mood after the meeting broke up. “This is the type of politics that made a lot of our constituents not trust us,” said Washington, who had abstained from the vote in protest. Also abstaining were Delegates Cory McCray and Antonio Hayes who, like Washington, were winners of their state Senate bids in the primary. The lone “no” vote came from Del. Bilal Ali, who came up short in his primary bid for a 41st District House seat. In the run-up to the vote, some had argued that it should be delayed until January or at least until after the November election. It was wrong, they argued, to allow lame ducks to vote or to exclude Baltimore’s newest House of Delegates members. Recent primary winners Dalya Attar, Regina Boyce, Melissa Wells, Stephanie Smith and Tony Bridges will, in heavily Democratic Baltimore, very likely be elected delegates in the November 6 general election. But they were unable to participate last night. “Melissa Wells should be able to vote,” the 40th District’s Hayes said, speaking up for the successful primary newcomer in his district. Speaking with The Brew after last night’s vote, McCray noted that he, Washington and Hayes are exiting the House and will be able to vote for delegation leadership in the Senate. Amid predictions in recent weeks that Glenn was to be anointed the delegation’s new chair, Del. Nick Mosby had expressed interest in placing his name in contention. But with votes for the 4oth District delegate clearly lacking last night, his supporters never put him forward. Instead the voting session for just one potential new chair, Glenn, went forward at a meeting chaired by the delegation’s longtime leader, Del. Curt Anderson. Last month, the 68-year-old was stripped of his legislative leadership posts and ordered to undergo sexual harassment training after an ethics committee investigated multiple allegations against him, including an alleged sexual assault the panel was unable to confirm. Some had criticized party leaders for not acting more decisively on Anderson, including more than 90 women from the 43rd District who pressed state party leaders to ask Anderson to resign if he was not cleared of charges. Meanwhile, Legislative Black Caucus leaders, including Glenn, its immediate past president, were criticizing party leaders for distancing themselves from Anderson. “He’s still the nominee of our party,” Glenn had said, arguing that white politicians accused of wrongdoing have not been similarly treated. “I also feel we should not wait until November,” McIntosh said, addressing delegation critics with a promise that their concerns could be addressed with an overhaul of its bylaws. Del. Brooke Lierman, who supported Glenn, said she agreed with McIntosh about the need for “a complete overhaul” of the delegation’s rules. Watching the vote from the audience was Adam Jackson of the research and advocacy group, Leaders of a Beautiful Struggle. Jackson had lobbied against Glenn because of her positions on mandatory minimum sentencing and her endorsement, during the primary, of mandatory minimum supporter Senator Bobby Zirkin, of Baltimore County. The 41st district’s Ali, speaking after the meeting, raised that issue, too.